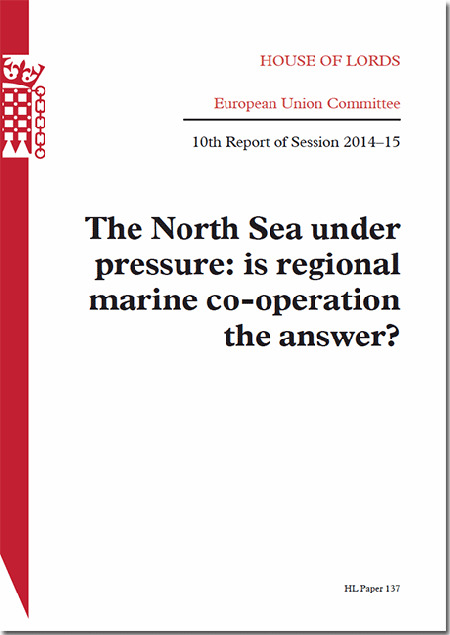 House of Lords paper 'The North Sea Under Pressure: Is Regional Marine Co-operation The Answer (HL 137)' looks into the environmental future of the North Sea, which is already one of the most industrialised seas in the world. While ships queue to progress through the southern channels of the North Sea, navigable space allocated to windfarms could, according to some estimates, increase fifty-fold within just a few years. At the same time, it is essential to develop coherent networks of environmentally protected areas and engage in the European Commission's long term plan to support sustainable economic growth in the marine sectors. The Committee discovered that there is no single map or database plotting the various uses of the Sea. Data is not in short supply, but duplication of effort wastes resources and means that the most value is not being derived from what is available. The Committee concludes that there is an urgent need to commit to a properly resourced single cross-border data collection initiative. If appropriately funded the evolving European Marine Observation and Data network could fulfill this function. Tensions in the marine environment - both between contrasting environmental and economic objectives and between different economic users - can be managed through effective planning. Such planning is embryonic and unpredictable around the North Sea. The report recommends that the UK Government should initiate longer term strategic planning for the seas around the UK coastline, along the lines of the Dutch North Sea 2050 Agenda.